Kidrobot merges urban street trends, fashion, and pop art. Collaborating with top international artists, Kidrobot incorporates graffiti, fashion, industrial and graphic design, illustration, and music elements. Whimsical, vibrant and functional best describe the Kidrobot 'Aviator' Bag . 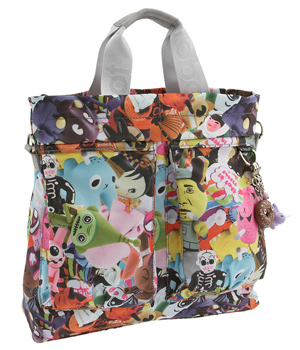 It features Kidrobot's Pile-Up print, with twin front pockets, interior compartments for cell phone and PDA, and removable straps for a tote and mailer carrying option. It is lined with the KidRobot logo and comes with a Yummy Donut, Smorkin' Labbit and MUNNY charms. All accessories come with one Kidrobot collectible toy. Staci Rutherford is an accessory buyer and trend correspondent who constantly researches the latest handbag trends, new designers, and what celebs are wearing. Visit Handbag Report to connect with others around the globe who love handbags as much as Staci does!